In 1853, my ancestor Hiram Edde and Lousia Daws were convicted of Lewdness in the Court in Shelbyville, Bedford County, TN. The Court found Edde guilty and Edde appealed to the TN Supreme Court. The case was heard by the Tennessee Supreme Court. The case was remanded back to the County Court in December 1853. Edde presented to the Court a pardon by the Governor of TN, Andrew Johnson. Johnson would serve as Governor of TN from 1853 -1857 and as Military Governor of TN from 1862-1865. 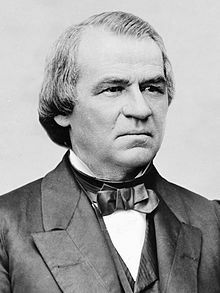 In March 1865, he would become Vice President under Abraham Lincoln, (a distant cousin of Edde’s) and in April 1865 at Lincoln’s death, Johnson would become the 17th President of the State of TN.